1. Craft Beer Brunch and Surf Combo at Paradise Point. The package includes a guest room, brunch, three-hour “Dad & Me” surf lesson and one-year membership to the Surfrider Foundation. Packages start at $365. 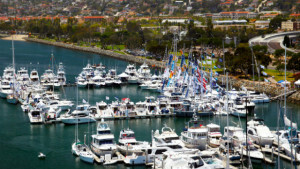 The San Diego International Boat Show. 2. San Diego International Boat Show. Whether Dad likes power boats or sailboats, the 2015 show is the place to see them all, with 120 vessels on display, including the giant 125-foot sailing yacht Kaori. The show opens at 10 a.m. on Father’s Day at the Sheraton San Diego Hotel & Marina on Harbor Island. Tickets are $12 and children 15 and under are free. 3. Father’s Day Brunch at Roy’s. The Pacific Rim-themed restaurant’s two locations in San Diego are offering a two-course brunch menu for $35.95 per person. Each table will receive a $20 dining card to use during a future visit to Roy’s. 4. Locally-Made Golf Equipment. If Dad’s a golfer, Callaway Golf in Carlsbad has a number of Father’s Day equipment specials. Recommendations includes the Mack Daddy PM-Grind wedges, a laser range finder and Chrome Soft golf balls. 5. Flagship‘s Beer & Brats Cruise. Invite Dad to cruise on San Diego Bay while enjoying hot brats and bottomless domestic brews. The buffet offerings also include seafood, breakfast favorites and carving stations. The price is $64.50 for adults, $38.70 for children 12 and under. Prime-rib dinner cruises are also scheduled. 6. Smoked Prime Rib & Beer at Kitchen 4140. For Father’s Day, Executive Chef Kurt Metzger will prepare a special smoked prime rib that will arrive to the table alongside a flight of beers from one of the pioneers of the craft beer movement, California’s North Coast Brewing. The special brunch is available at the Bay Ho restaurant from 9 a.m. to noon. 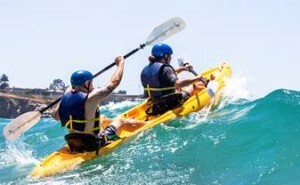 Kayaking off La Jolla with Everyday California. 7. Kayaking & Snorkeling off La Jolla. Everyday California is offering ocean adventures in the La Jolla Ecological Reserve, including kayaking, snorkeling, surfing and stand-up paddle boarding. Plus, you can buy Dad a shirt from the company’s growing apparel line. 8. 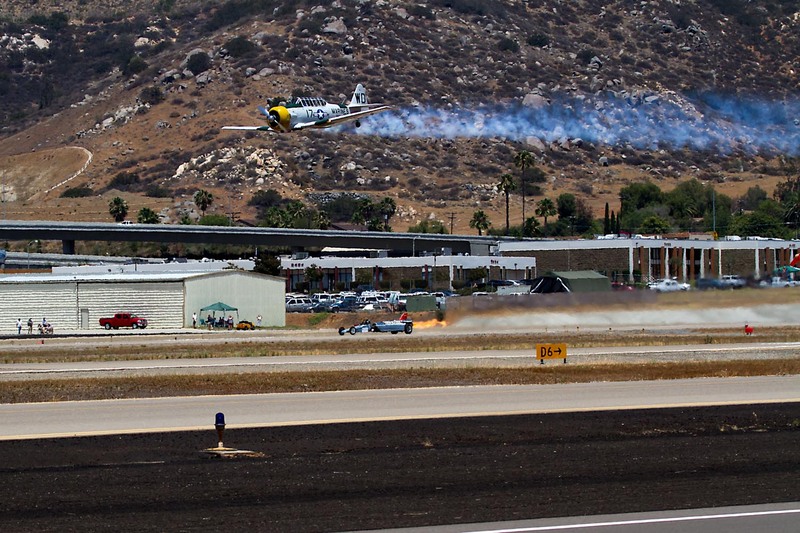 Air Show At Gillespie Field. 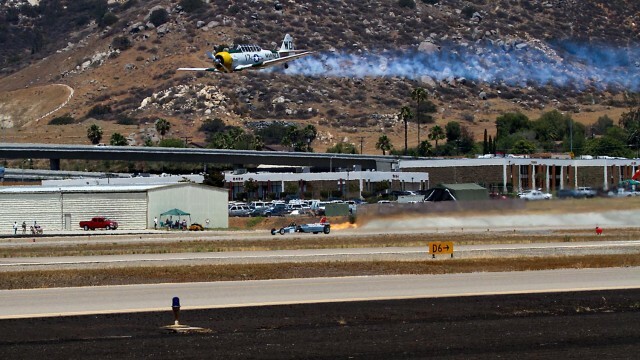 If you Dad dreams of flying, take him to the annual air show at Gillespie Field in El Cajon to see a collection of historic aircraft from World War II. Gates open at 9 a.m. and tickets starting at $16 can be purchased online. 9. Brunch with Shamu at SeaWorld. Families can enjoy a poolside buffet with Shamu and his trainers. The brunch features a special killer whale presentation that highlights the close relationships the killer whales have with each other and their trainers. Tickets start at $55. 10. Cruise on the Historic 145-Foot Schooner Californian. The Maritime Museum of San Diego has scheduled a three-hour, Father’s Day lunch cruise aboard the Gold Rush-era revenue cutter Californian. The journey includes a souvenir photo, sandwich and cold beer. Tickets are $70 for adults and $49 for children 12 and under and include admission to the museum. What’s your pick for an unforgettable Father’s Day in San Diego? Let us know in Facebook comments below.